Today I will give you the recipe for this Vegan Coconut Cake, which also happens to be Paleo, Refined Sugar Free, Gluten-Free. Vegan baking is my new area of curiosity. And when I think about the reasons why I like making vegan desserts, it’s mainly because of the ingredients, and how I get to play with different types of flours, sweeteners, oils, butters, etc. In regular baking, eggs, milk, butter, sugar, are staple ingredients. And they are easy to work with. Eggs will give your cakes the fluffiness it deserves, and butter will make buttercream, which I don’t even need to explain why everyone loves. And yes, you can make vegan buttercream with something like Earth Balance, and even use organic powdered sugar. But, at the end of the day, I guess that what I like the most about the vegan and paleo baking styles is that they involve much less processed ingredients for the most part. Which is why all of the Vegan Desserts I’ve published so far are also paleo, refined sugar free, and gluten-free. I really like the challenge of vegan and paleo baking. And I also love the idea that I am eating food that has been less processed. 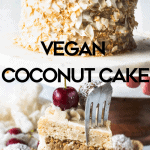 So let’s talk about this Vegan Coconut Cake now! This was the first paleo and vegan layer cake I ever made. I loved the results so much. This cake was impressively delicious. 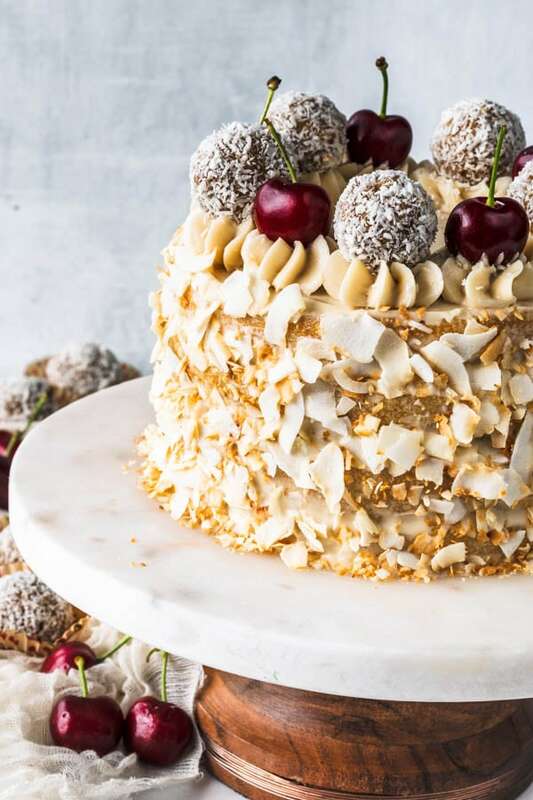 Layers of cake, with a toasted coconut custard filling, covered in a vanilla frosting. Now, let’s talk about the frosting! 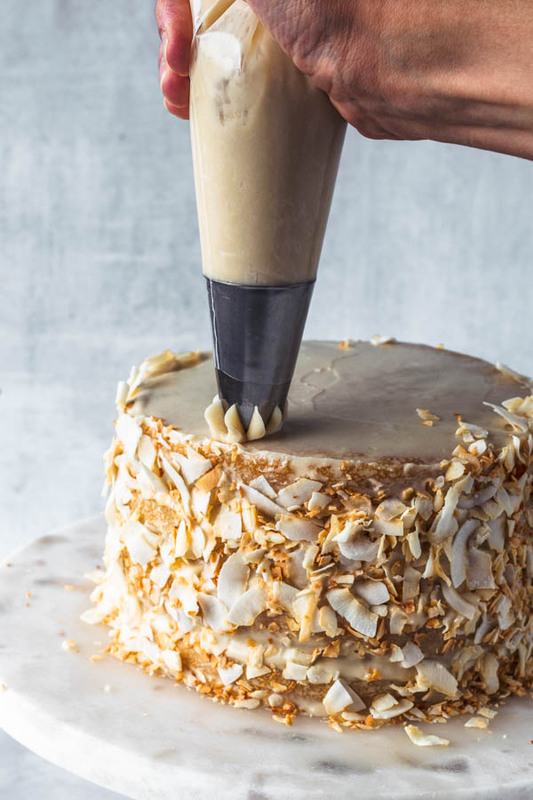 This is a paleo and vegan vanilla frosting, which can even be piped. I am very new to the whole vegan/paleo frosting world. And this has been one of my biggest challenges with the vegan/paleo baking, finding a frosting that will look beautiful to pipe on a cake, or on cupcakes, and that will also taste delicious. This frosting was pretty delicious! It complimented the cake very nicely. I got the basis for my recipe here. I adjusted a few ingredients and the method a little bit. But you can go to the Real Food RN website to see the beautiful cake the blogger made with her frosting, which she calls the best paleo frosting ever. And it might be. I have to experience with more frostings to be able to give you the verdict. But the frosting piped great on top of the cake, and that alone was a huge win for me. About the toasted coconut custard filling, you will use about half of it to fill the cake. And you want to make sure that the coconut custard is at room temperature when you spread it on the cake. It can’t be hot, because you really shouldn’t frost a cake with hot frosting, and it shouldn’t be cold from the fridge, because it will be too solid to spread. With the other half of the custard filling, I made the coconut balls you see on top of the cake. Those coconut balls were a real treat! I simply placed the remaining coconut custard in the fridge until solid. Then, I scooped out small amounts and rolled them between my hands to make smooth balls, which I then coated in coconut flakes. This was probably the best vegan and paleo cake I’ve ever had! But then again, I really love coconuts. I also like how I used the cherries to decorate the top, since they made the cake so pretty! Anyway, I’m so happy that I made this cake and it came out even better than I was expecting! 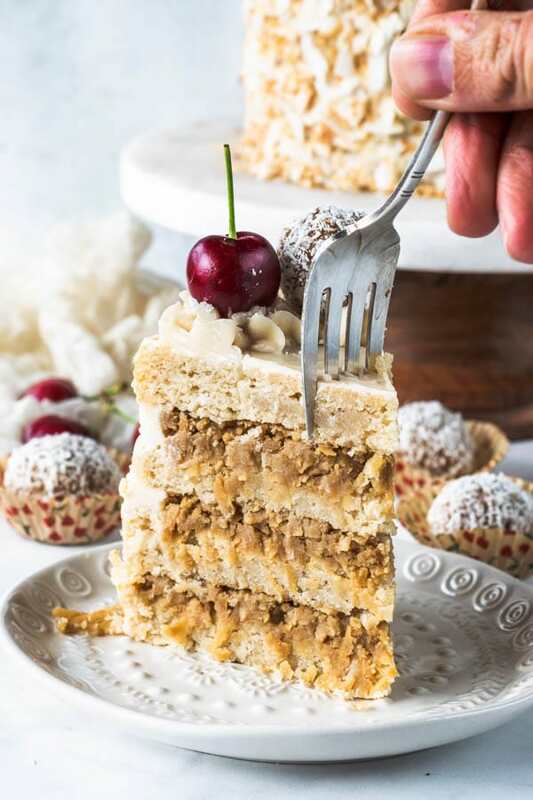 This Vegan Coconut Cake would make a very nice paleo or vegan birthday cake, or even just a nice layer cake to bring to a end of the year holiday party! Hope you all liked my Vegan Coconut Cake too. Thank you so much for your support and for reading my blog. If you want to check out some more paleo or vegan desserts, you can click here. Or I will tell you what some of my favorite ones are: Vegan Peanut Butter Tarts, Pecan Brownie Vegan Pie, Vegan Brownies with Caramel Sauce. 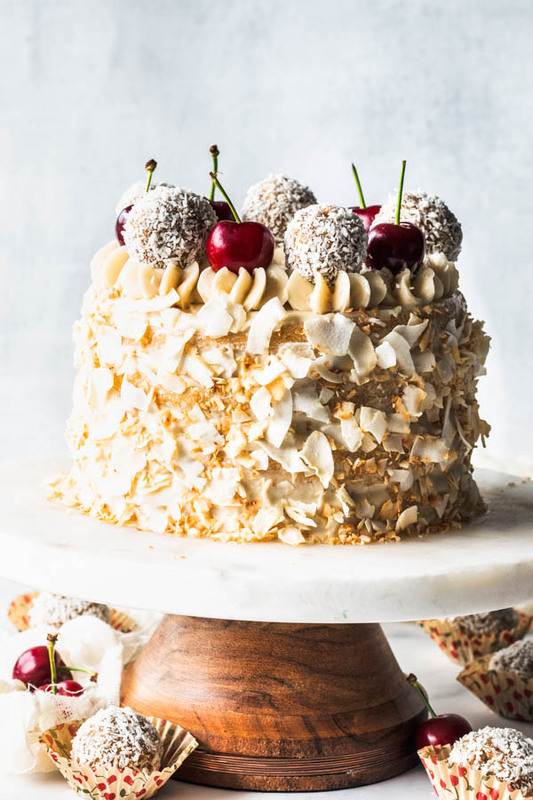 This Vegan Coconut Cake features a delicious toasted coconut filling. Also paleo, refined sugar free, gluten free. Grease and line with parchment 4 6-inch cake pans, or 2 8-inch ones. Mix coconut oil, coconut milk, almond milk, lemon juice, maple syrup, and vanilla in a bowl. In another bowl, combine all dry ingredients, almond flour, cassava flour, coconut, baking powder, baking soda, and salt. Pour dry ingredients into wet. Mix until combined. Divide into cake pans evenly. Bake for 10-20 minutes, depending on the size of the cake pan you are using. Cake will have browned, puffed slightly, and when you press it down very lightly with your finger, the cake springs back. Let cakes cool down before proceeding. Place milk, salt, and coconut sugar in a small saucepan, over medium heat. While you bring the coconut milk, salt, and coconut sugar to almost a boil, whisk the almond milk and cornstarch together. By now, sugar should have dissolved. Add almond milk and cornstarch mixture to the pan. Cook custard, stirring the whole time, while it gently boils and thickens. Add shredded coconut, vanilla extract, and mix. Once custard seems thick, remove to a heat proof bowl. Let it rest on the counter until it comes to room temperature. You will use about half of the Coconut Custard to fill the cake. 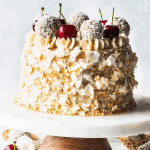 With whatever remains, you can make these Coconut Fudge Balls to decorate the top of the cake. For that, simply place the leftover vegan coconut custard in the fridge until solid. Remove and scoop small amounts of the custard, and roll it between your hands to form a smooth ball. Then place the 1/2 cup of shredded coconut in a bowl, and coat the balls, so they won’t stick. Store it in the fridge for up to 4 days. Place all ingredients in a small food processor and process until smooth. You can use a mixer too, just make sure to beat the shortening very well before adding the other ingredients, and then add the rest of the ingredients later, because otherwise, your shortening might become lumpy. You will have to watch the consistency of the frosting, according to what you want to do with it. This frosting will pipe nicely, but you’ll have to leave it in the fridge for a little while. Just enough to firm up. If it gets too hard, just leave it on top of the counter a few minutes. It will become softer in just a few minutes. Spread a layer of the cooled down coconut custard over your first cake layer. Make sure that the coconut custard is cooled down but not straight from the fridge. Just being room temperature will work. If you place it in the fridge it might be hard to spread it over the cake. Place a cake layer on top and repeat this until done. Use an offset spatula to spread frosting over cake. You can toast some coconut flakes and use your palms to stick some to the side of the cake once you frost it. I decorated the top of my cake with some of the frosting, cherries, and the coconut fudge balls made with the leftover coconut custard. Store your cake in the fridge. Let it sit for a few minutes at room temperature before serving. Cake will store well in your fridge for up to 4 days. *You can toast the coconut by simply placing a layer of dried coconut flakes on a non stick frying pan. Place over medium heat, and cook coconut for a few minutes until it's golden brown. Make sure to stir and flip the coconut flakes constantly to brown evenly. 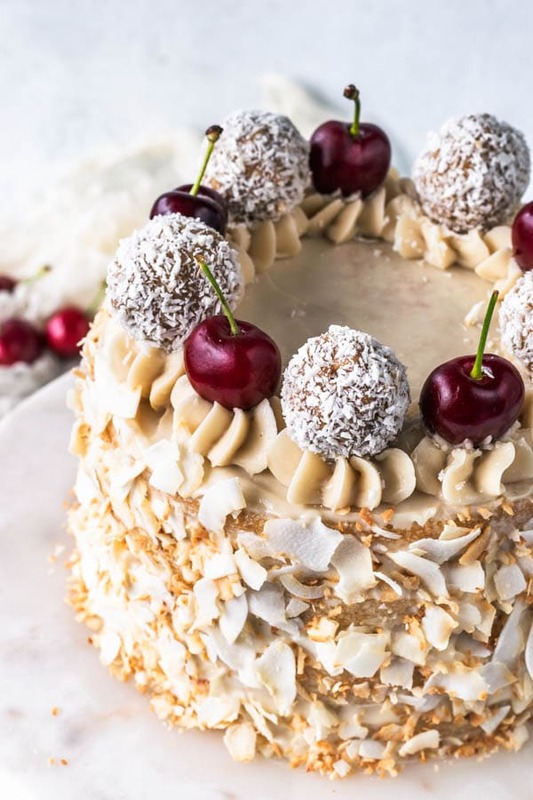 I do not like coconut for some reason so this is not the cake for me, but my mom would love this! She to really got into Vegan baking at our Coffee Shop! She loved the challenge and created a large following of Vegans! It helped that our shop was within walking distance of an art collage, the students there seemed to be mostly vegan. I LOVE Coconut! Especially in a cake. I have Diabetes and This is a great recipe for me to be able to enjoy something sweet! Thank you so much for your hard work and great recipes Camila!! 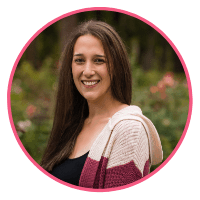 I would love to be able to share your recipes on my blog let me know what I need to do to get your permission! Due to my illness, I am not able to bake or cook full time for a blog but I do share recipes with my readers. Hello Stacy, I am very happy you like my recipes. However I do ask for people not to post my recipes on their website. If you want to maybe you could put a picture that links to my recipe on my website. I appreciate you asking me. Have a great day!